Hello. I recently bought a small quantity of Hornady's new "Critical Defense" line of ammuntion in both .380 ACP and .38 Special. Neither is +P-rated. 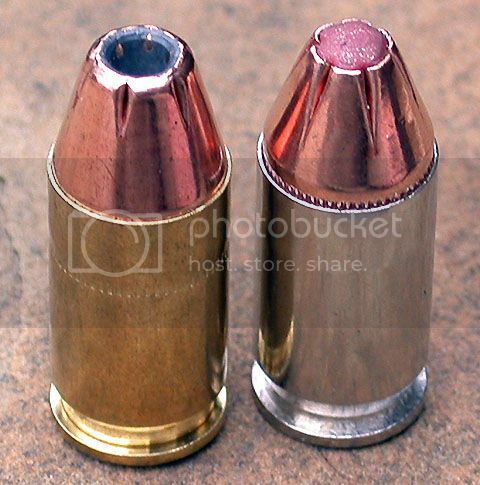 Hornady's XTP line of ammunition uses a bullet that usually expands to about 1.5 times its original diameter (left). The new Critical Defense ammunition uses Hornady's FTX bullet (right). It is a jacketed lead bullet but one that has its hollow cavity filled with a very maleable plastic material that prevents its being clogged and almost guarantees expansion. Based on my admittedly limited and statistically-invalid layman's "tests", I believe it to be so. I chronographed each load and found an average velocity of 911 ft/sec when the .380 ACP 90-gr. Critical Defense load was fired from a 3.5" bbl Bersa Thunder. This does not meet the published velocity of 1000 ft/sec from the company. The .38 Special load was fired from a well-used S&W Model 042 with the usual 1 7/8" bbl. Its average velocity measured 856 ft/sec, far short of the nominal listed velocity of 1175 ft/sec. These figures are based on 10 shots fired 10 feet from the chronograph screens. In my opinion, these are probably the best performing loads for a 38-caliber revolver. All but the Hornady 110-gr. Critical Defense (far right) are +P. L to R: Remington 158-gr. LHP +P, Corbon 110-gr. DPX +P, Speer 135-gr. Gold Dot +P, and Hornady 110-gr. Critical Defense. It becomes pretty obvious that either longer barrels or pressure barrels were used when Hornady got their data. In super-saturated newsprint, average penetration (also based on ten shots with 5 of each caliber fired through 4 layers of an old cotton/polyester towel) was 6.75" for the .380, which probably translates to just over 10" penetration in calibrated 10% ballistic gelatin. This is as good as I've seen for an expanding bullet in this caliber. Most do about 7.5 to 8" in gelatin, it seems. The .38's were fired following the same protocol and achieved an average velocity of 856 ft/sec with penetration in the soaked newsprint averaging 7.6" or probably about 11.4" in ballistic gelatin. I was amazed at the extreme consistency not only the expansion's reliability but the small differences in speed, shot to shot for each caliber. I could not differentiate between the expanded bullets fired through the towel and those that were not. Both the .380 ACP and .38 Special Critical Defense loads proved exceptionally consistent. Average expanded diameter for the .380 was approximately 47-caliber and 48-caliber for the .38 Special load. In my admittedly limited experience with this new ammunition, it appears to work and work very well. This ammo may elevate rounds whose diameters start with a "3" to a higher level of reliable terminal ballistic performance. I'd like to see testing of how it performs from very short barrels - e.g., Ruger LCP and KelTec. I'm also looking for data from street incidents that tell the most meaningful story, but it sure looks promising at this point. Looks very similar to HST. Alan - ANYTHING I write is MY OPINION only. Certified Curmudgeon - But, my German Shepherd loves me! AEA wrote: Looks very similar to HST. The HST is designed for violent expansion as well. The big difference is the polymer plug in the Hornady ammo. It keeps barrier material (clothing, wood, drywall, etc.) from plugging up the hollowpoint and making the round perform like an FMJ. This enhances expansion reliability by quite a bit. I carry a Bersa Thunder a lot, so this was very helpful to me. Hello. You are most welcome. I am going to have to check this stuff out. I currently carry XTP in my Ruger LCP because it is the best-feeding ammo I've come across, and Hornady ammo has always been high-quality stuff. The price looks good. The only thing that I don't like is that nickel-plated case. Hornady brass is always so slick, it seems like a shame to cover it up with nickel. Too bad they don't make it in 9x18. Hello. Yes, I wouldn't mind it at all in 9mm Mak. The polymer filling looks very similar to Cor-bons Pow'R Ball, except the ball in the Cor-bon load makes the round feed like ball ammo. And you can get it in 9mm Mak and many others. According to the websites Hornady critical defense numbers 9mm 115gr. 1140/332 (vel/energy at muzzle) vs. the Pow'R ball 9mm (p+) 100gr. 1450/467 (vel/energy at muzzle). Where did you find this ammo? I did a search but came up short. TexasVet wrote: The polymer filling looks very similar to Cor-bons Pow'R Ball, except the ball in the Cor-bon load makes the round feed like ball ammo. And you can get it in 9mm Mak and many others. According to the websites Hornady critical defense numbers 9mm 115gr. 1140/332 (vel/energy at muzzle) vs. the Pow'R ball 9mm (p+) 100gr. 1450/467 (vel/energy at muzzle). 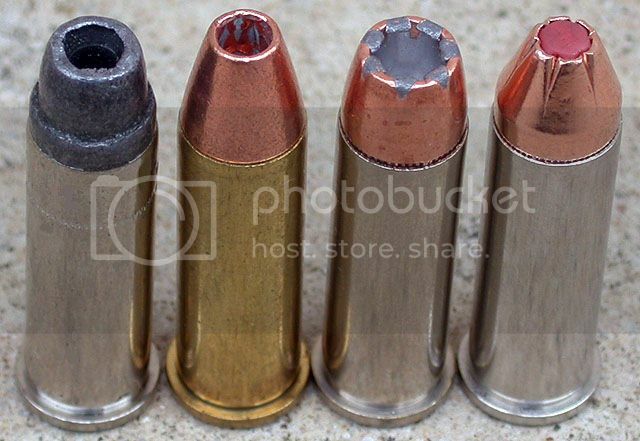 From the very limited and generally informal test results I've seen, the soft hollowpoint filler in the Critical Defense ammo and in Federal's Expanding Full Metal Jacket offering seems to offer an increase in expansion reliability over many other rounds. My understanding of the purpose of the Pow'r Ball's plastic tip is feeding reliability, not prevention of plugging by barrier material. Also, in the Pow'r Ball tests I've seen, the bullet and jacket often come out in pieces, where the Critical Defense rounds appear to retain virtually all of their weight . I haven't seen a head to head test of the new Hornady and Federal rounds against the CorBon Pow'r Ball, but it sure would make an interesting comparison. Anybody know a gun writer with access to lots of free ammo from all 3 companies? Hello. I bought it at Ammunition To Go (http://www.ammunitiontogo.com" onclick="window.open(this.href);return false;) but I think that they are out as I cannot find the Critical Defense ammo listed there again. Thanks Stephen. As usual, the article is excellent as are the photos. Yes, thank you! The information looks really good, and now you have me seriously interested in trying to find a box or two of this stuff. I hope it becomes available soon. It's still up on ammunitiontogo.